Lake Batur is known as the largest lake in Bali which is located in the caldera of Mount Batur, now his condition is very worrying. The water level of Lake Batur usually always overflowed and flooded acres of farmland, now begun to recede. Usually the water is always overflowing and inundating farmland until now receded due to the drought experienced by the island of Bali. 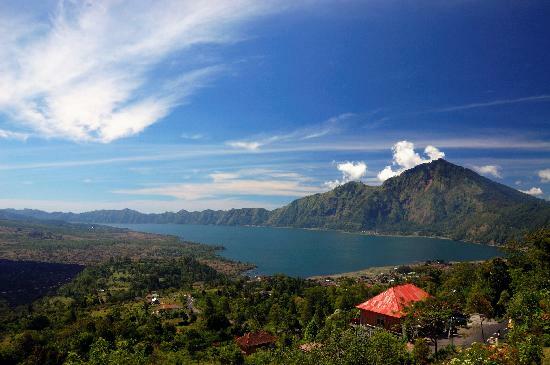 Terunyan village is a village that is usually always get a puddle of Lake Batur. It was always experienced by villagers, because their livelihoods depend on Lake Batur. Because the lake is a source of livelihood and economic support Terunyan village residents. Lake Batur water receding slowly but continue to occur. It's caused by Bali experienced a very long dry season. Even the heat of the sun is felt in Bali too high. So that evaporation and shrinkage of the lake water more quickly. Shrinkage of the lake water has been felt by villagers Terunyan since August, and now the faster depreciation. Actually, Lake Batur is now experiencing silting. Shallowing of the lake due to the dust and the waste of the citizens who throw garbage into the lake. Currently, the lake receded, a lot of garbage visible at the bottom of the lake that is now receding. Some people are concerned with taking environmental hygiene and clean up the rubbish seen on the lake. Batur Lake water receded would look very badly if it does not happen silting of the lake. Due to silting of the lake resulted in a very high water levels. So during the rainy season, people's homes around the lake will be inundated. During the dry season such as this, which initially inundated homes, can now be inhabited again.